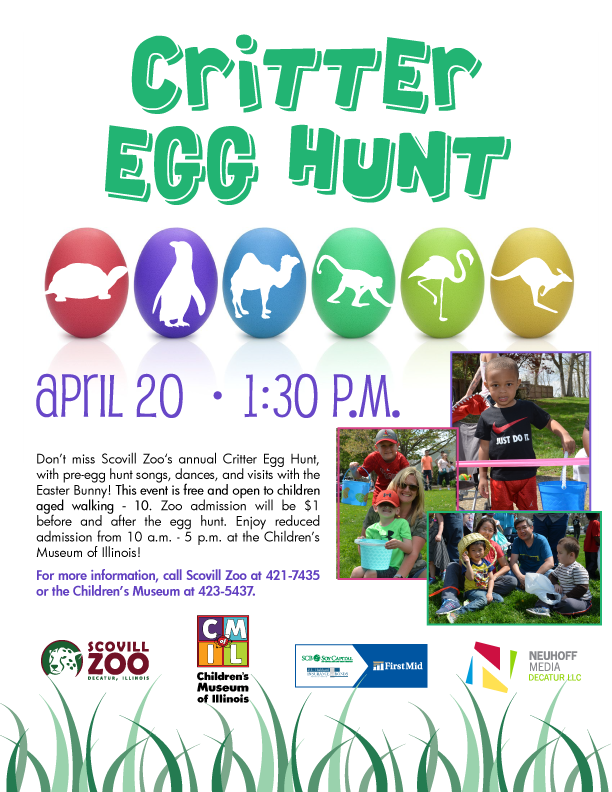 Scovill Zoo and the Children’s Museum will hold their annual Critter Egg Hunt at 2:00 p.m. on Saturday, April 20, free for ages 10 and under. Attendees will enjoy pre-egg hunt songs/dances at 1:30 pm, followed by an egg hunt on the lawn and visits with the Easter Bunny. Enjoy $1 zoo admission before and after the egg hunt and reduced admission at The Children’s Museum of Illinois from 10 a.m. – 5 p.m. For more information, call Scovill Zoo at 421-7435. Sponsors include First Mid Bank and Trust and Neuhoff Media. Location: Scovill Zoo, 71 S. Country Club Rd.